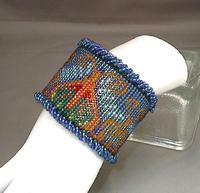 Colours, quality workmanship and an unusual design go together to make this a cuff bracelet that's truly one of a kind. The pattern has an exotic, vaguely Oriental feel to it and is worked in the Ndbele (herringbone) stitch, using bright jewel toned seed beads. 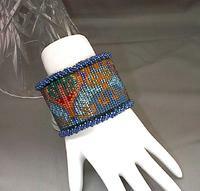 The finished piece was sewn, pillowslip-fashion, to a piece of Ultrasuede, a brass cuff bracelet was slipped between the bead work and the fabric, and then the fourth side was sewn shut. The underlying brass actually improves the shine of the seed beads, particularly that of the transparant topaz: their glow is nearly incandescent. 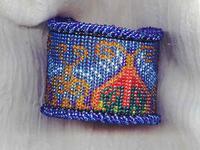 The rolled braid edging on either side of the cuff is made of sparkling sapphire and amethyst seed beads. The Ultrasuede underside makes the cuff comfortable in all circumstances; and the cuff is flexible enough to adjust to fit almost any wrist. 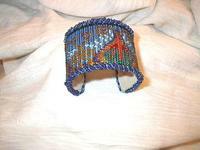 This cuff bracelet is absolutely stunning ... and it's absolutely from SPARKLE PLENTY, of course. The 5mm light emerald firepolish crystal have a lovely luminescent finish that makes them shimmer like starlight. Wear this original creation seafoam and crystal clear necklace on days when you dare to stand out from the crowd. Here's a beaded bracelet that's a little different from the run of the mill: it's a silver plate cuff, but the visible part is all bead work.